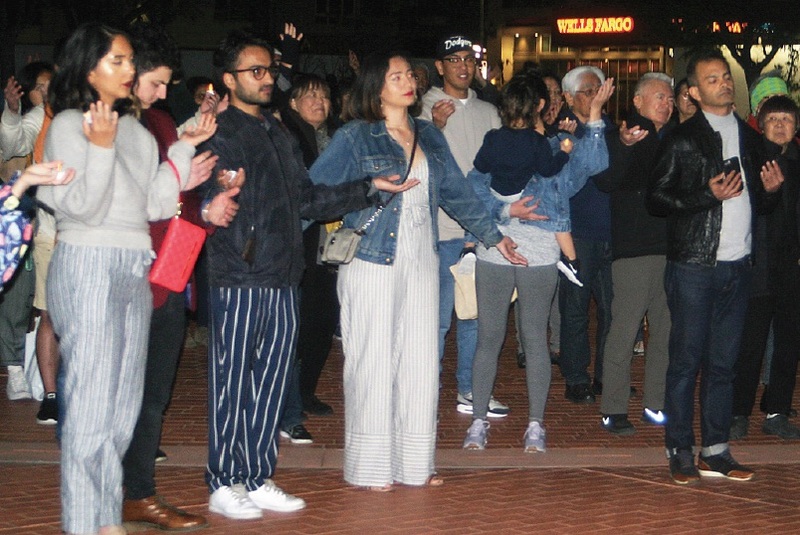 In response to the mosque shootings in New Zealand, Vigilant Love hosted a vigil and healing space in the JACCC Plaza on March 22. An Australian gunman, described in media reports as a white supremacist, killed 50 people and wounded 50 more at two mosques in Christchurch. It is the deadliest mass shooting in modern New Zealand history. Daren Mooko, interim president and CEO of the Japanese American Cultural & Community Center, said, “I welcome you as fellow Angelenos from all parts of all neighborhoods. I welcome you to the JACCC as fellow Southern Californians, people from all over, and I’m glad you’re here tonight and I want to say thank you for coming … I welcome you with open arms and open heart. Sahar Pirzada, co-chair of Vigilant Love, gave a brief background of the organization. “We are a grassroots organization challenging Islamophobia through arts, healing and activism, and we’re a team of social workers, lawyers, artists, retired teachers, activists. We are Muslim, queer, Buddhist trans, Jewish and multigenerational … We’re all in Vigilant Love together because we know that radical relationships are the social change strategy needed to fight Islamophobia. “One [way]is that they would meet in the month of Ramadan, which is just around the corner, and they would break fast together and get to know about the practices of each other’s communities. They also started caravaning together out to Manzanar … and they also started youth programs for Muslim American and Japanese American youth to learn about each other and organize together. Participants in the vigil take a moment to remember the victims of the massacre. Having visited mosques in different countries, she is “thinking about the lives that were lost and how they were trying to seek refuge in a time and a day when Islamophobia is rampant. So many of them were also refugees and immigrant backgrounds escaping violence from their own homelands … Muslims right now are being persecuted in so many different ways … Think about China and how being Muslim is considered a mental illness and people are being put an incarceration camps there. “But on Fridays, Muslims get together … It’s a mandatory appointment with God. It prescribes prayer for Muslims to meet with their lord and be in community with each other. And this white supremacist murderer in New Zealand knew that, he knew that this was a sacred time on Friday afternoons where he could find Muslims in their most vulnerable state … I want us to remember this, that this was no random act of violence. “This was a premeditated attack that was targeting Muslims and this is also not an isolated event. There’s an entire Islamophobia industry that is funding the narrative that Muslims are a threat to our societies and that we are an ‘other’ and that we are to be feared. Poet and Solidarity Arts fellow Samar Saif read a poem that she wrote as a way to process her feelings about the massacre, recalling her own experiences growing up Muslim. Vigilant Love’s traci kato-kiriyama asked attendees to pair up with someone they didn’t know and discuss what brought them to the event, ensuring that everyone left having made a new friend or acquaintance. Throughout the program, volunteers held up a banner that has been used at various events for the past few years to express solidarity between Japanese Americans and Muslim Americans. Attendees were invited to sign up for the next Manzanar Pilgrimage, to be held on April 27, as well as a Ramadan event in Little Tokyo in May.